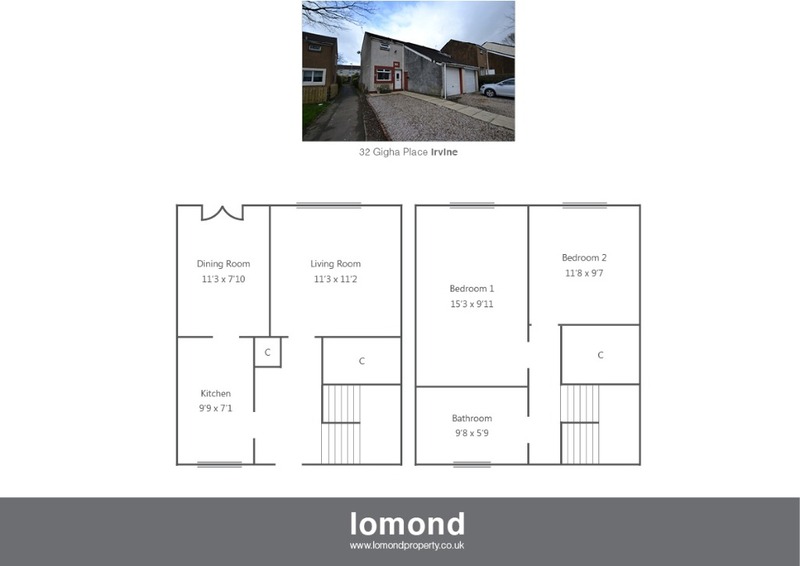 32 Gigha Place is an end terrace villa benefiting from private rear garden, off street parking and garage. Internally the property boasts two double bedrooms, lounge, dining room, kitchen and a family bathroom. In summary the property layout extends to an entrance hallway with two storage cupboards off, and stairs to the upper level. To the rear there is a lounge, with patio doors to the rear garden. The dining room is off the main lounge, which in turn allows access to the rear garden. The kitchen is well stocked with floor and wall mounted units, integrated gas hob, oven and hood. The upper level houses two double bedrooms, a large walk in cupboard and a family bathroom., with bath, over shower, WC and WHB al finished to neutral tiling. Externally there is off street parking leading to a brick garage. To the rear the garden is easily maintained, laid predominantly to patio slabbing and perimeter fencing. Gigha Place is a pleasant residential area. Irvine town is close by and provides access to a range of amenities including supermarkets, bars, restaurants and town centre shopping. There are a number of local primary and secondary schools within the greater Irvine area.